They say that there’s a pot of gold at the end of a rainbow. But during our adventure inside mysterious Sulpan Cave, we saw no glittering treasure. 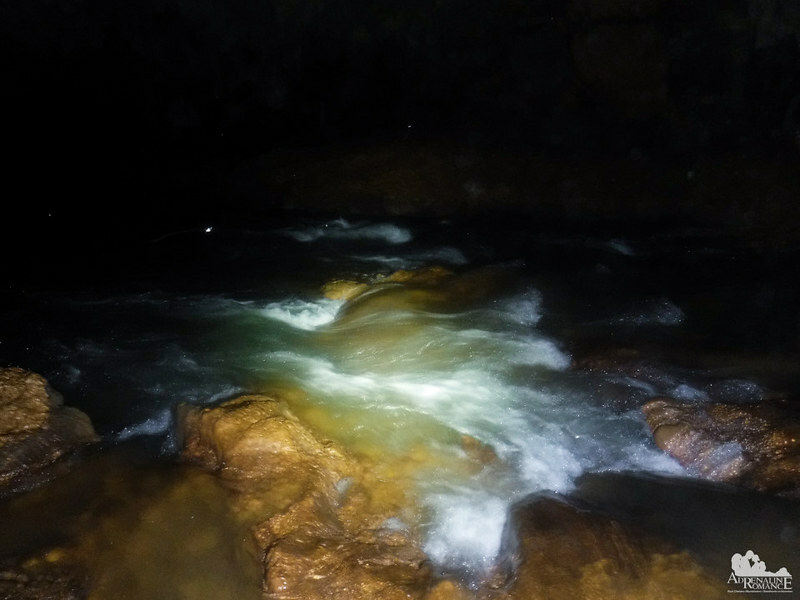 What we found at the end of a spellbinding waterfall was an otherworldly light-less realm of mysterious creatures, unseen geological treasures, and whispered secrets. Sulpan Cave is a perfect emissary of Mother Nature as well as a wellspring of human fear. Its dark, twisting tunnels effectively show us how majestic, enigmatic, and deadly our world can be. As our team reached the top tier of Pinipisakan Falls, we carefully walked along a boulder-filled bank to get to the entrance of that dark hole we saw from a distance. We had to be careful since the boulders were mossy and slippery. As the sun arced lower in the sky, the shadows of the forest slowly enveloped the canyon, making the landscape more ominous by the minute. 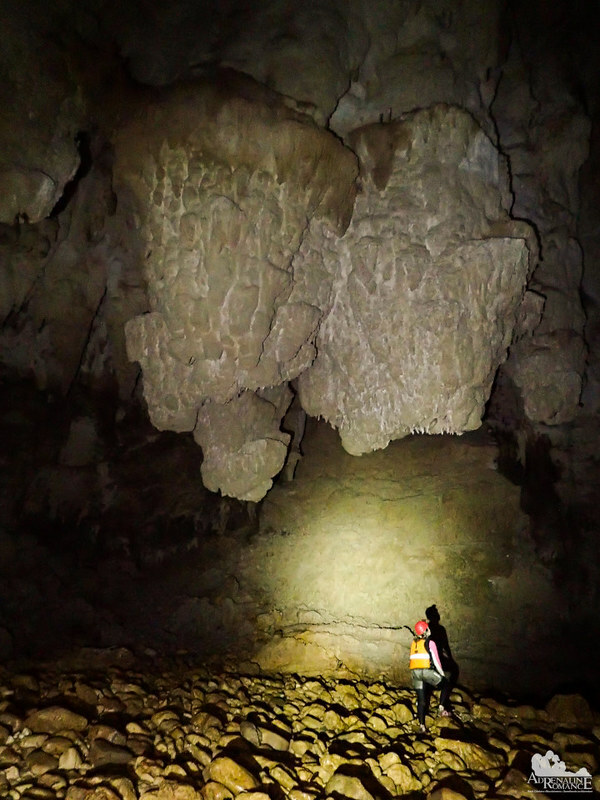 In a few minutes, our team came face-to-face with the maw of Sulpan Cave, one of the most remote caves in the Philippines. Foliage-covered cliffs form a protective fence around the cavern. 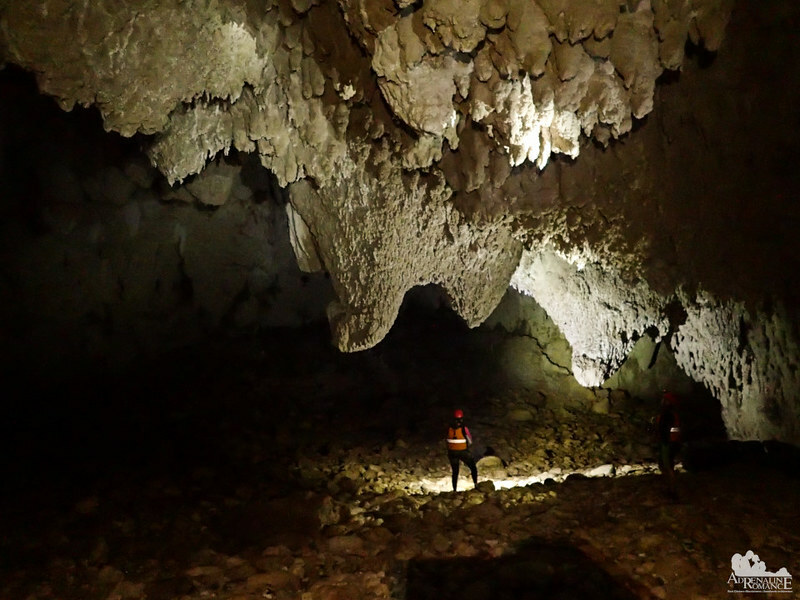 Inside the cave is a 2-kilometer network of branching passageways. Grand galleries and dramatic rock formations, which we were about to see, adorn this spectacular cave. 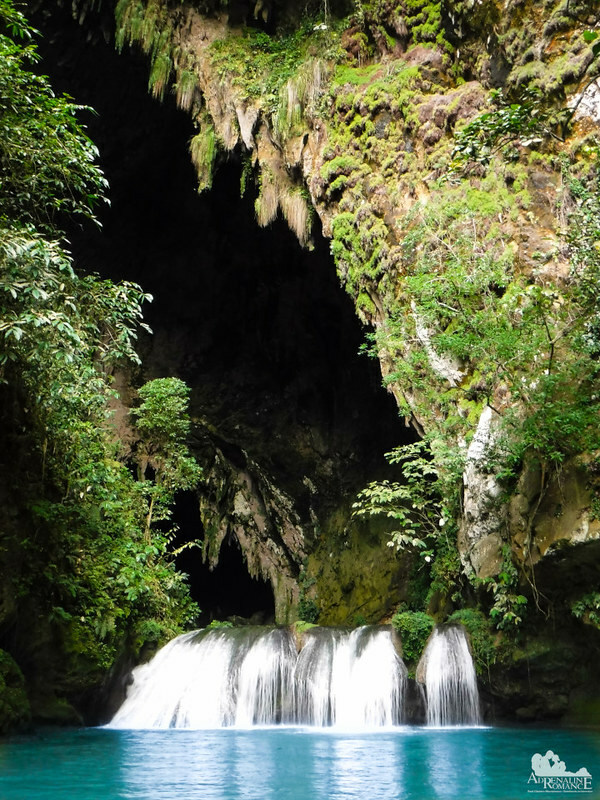 Pinipisakan Falls and Sulpan Cave were first discovered and surveyed in 1991 by French cavers led by Paul Marcel. 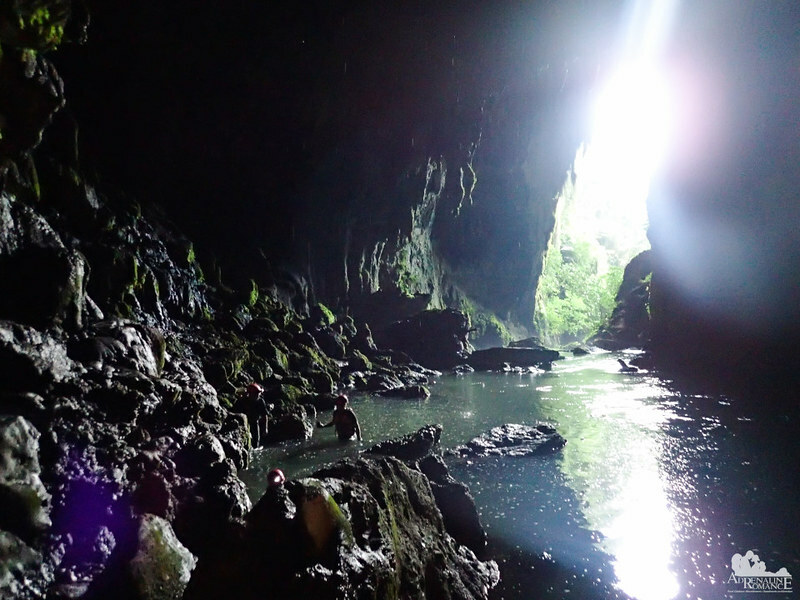 We were one of the very few people who were able to visit and penetrate Sulpan Cave not just because of its remoteness and difficulty but also because of the complex logistics, the technical nature of the adventure, and the security of the area. In addition, locals deeply fear caves like this; they believe Sulpan Cave is a haunt for malevolent spirits. 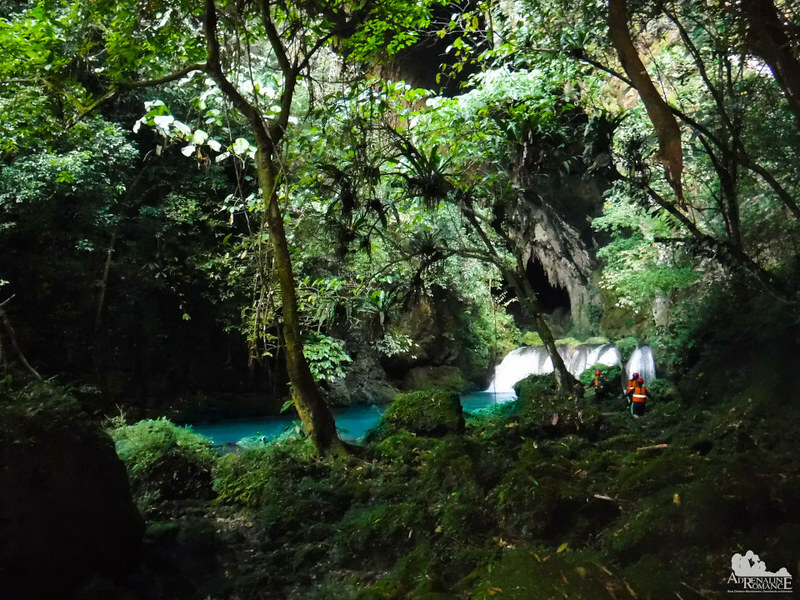 To get to the actual cave entrance, we swam in the cold, aquamarine waters of the top level of Pinipisakan Falls. We kept to the side near the mossy cliff to avoid the current at the middle of the pool. Co-guide Entoy set up a line so climbing the waterfall would be easier. A lot of handholds and footholds pockmarked the slope, but holding on to the rope helped save precious energy. Again, lead guide Joni stayed behind to take a photo so you could see the size of this level against the tiny humans who climbed it. It looks serene, but we avoided being ensnared under the spots where the curtain actually falls. The force of the water in these spots is strong enough to keep someone from surfacing. Even though we were actually right there, it felt surreal to be standing in one of the most beautiful caverns we’ve ever seen. On the other hand, the darkness beyond that giant hole gripped us with fear. Who knows the dangers inside it? 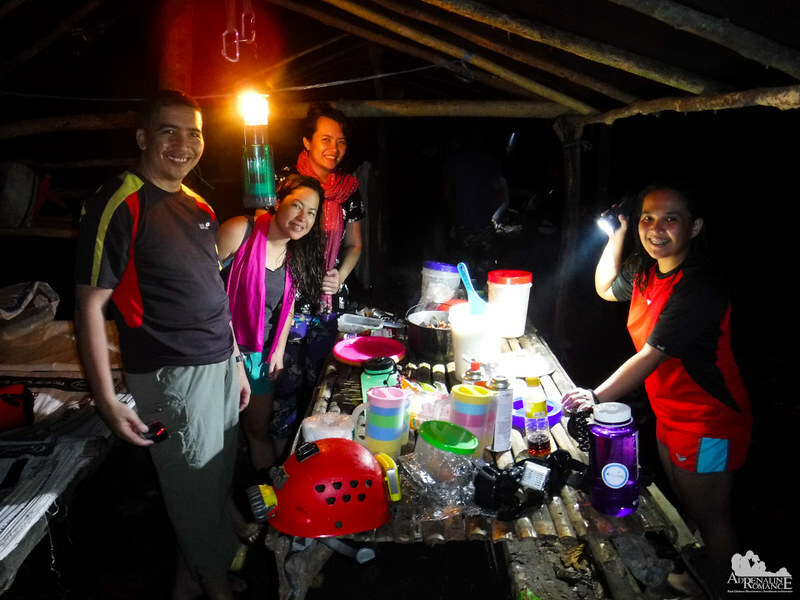 We took a short break to prepare our headlamps and consume a light snack. Quietly, we contemplated at the mysterious wonder before us. Caves are not man’s “normal” environment, so utmost respect must be exercised at all times when exploring them. We reminded ourselves that Mother Nature’s unpredictability can spell doom for us. While we enjoyed our snack of dried mangoes, bread, and chocolate, something caught our eye. It was a large stick insect moving closer to take a look at us. Stick insects, or phasmids, are indistinguishable from twigs if they keep still. As ambush hunters, they use camouflage, in the form of plant mimicry, to get closer to their prey and to hide—in plain sight—from would-be predators. This one’s curiosity got the better of him; he abandoned his camouflage and walked across our packs checking us out. 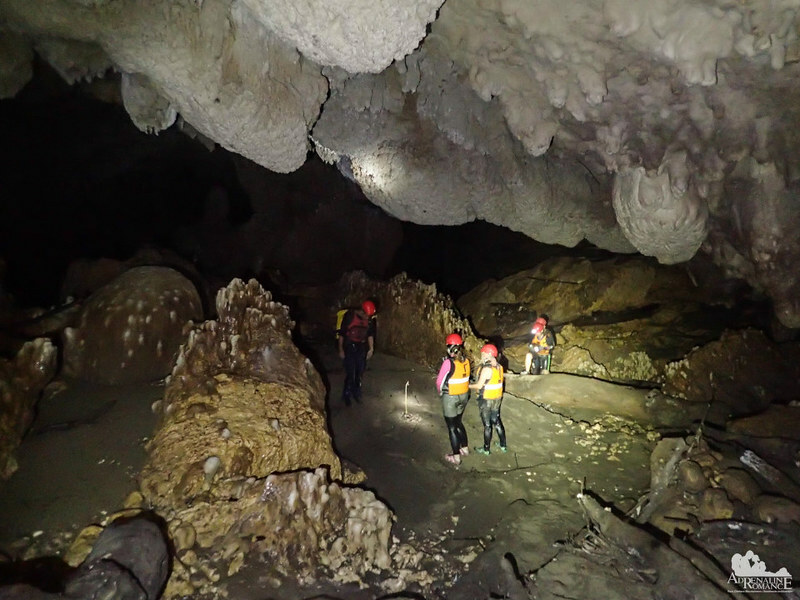 After attaching our headlamps to our helmets and finishing off our snacks, we started our caving adventure. We climbed on moss-covered boulders that formed a perimeter at the bottom of a large hill of soft mud and guano. This is the entrance of the first feature of the cave, a lofty opening called the Pleasure Dome. Walking through the Pleasure Dome was anything but pleasurable. We slipped as we climbed boulders, stubbed our toes through concealed rocks, and smeared our gloves with fresh and wet guano. Above us, swallows and bats chattered and squeaked in amusement as they looked at the clumsy humans trying to make way into their domain. This was our last look at daylight, and we truly took it in our spirits. Entoy said that, based on whispered tales, the opening sometimes resemble a cloaked saint. The cave’s biological wonders began to show themselves as soon as the last flicker of daylight disappeared. Under some rocks, we found these glowworm larva as thin as delicate spiderwebs. They catch and feed on mosquitoes, midges, and other small insects by entangling them in their webs. Just at the border of the Pleasure Dome was a small lake. 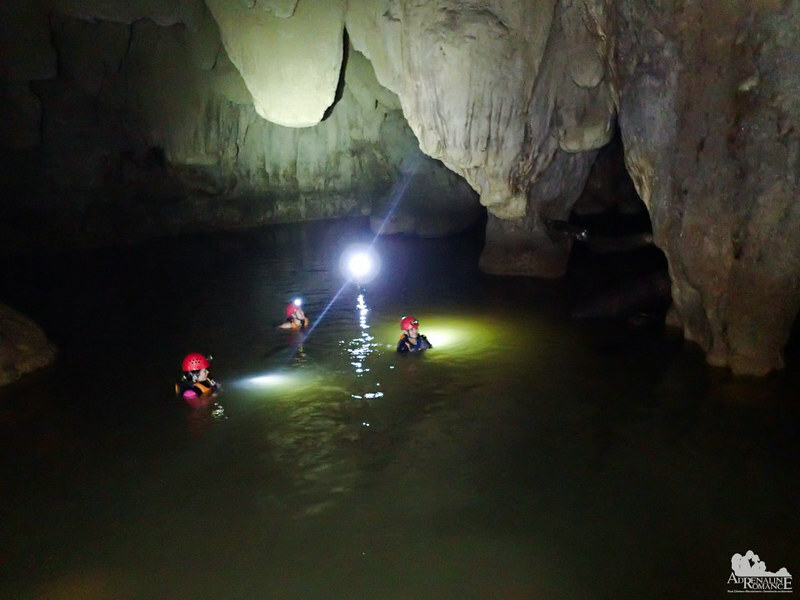 To reach the deeper parts of Sulpan Cave, we need to swim upstream, fighting the relatively strong current. Easier said than done because we had to swim with light movements. That’s because there are large rocks hidden from view at the bottom of the lake. We could hit these rocks with a strong but careless kick or arm stroke. Ouch! 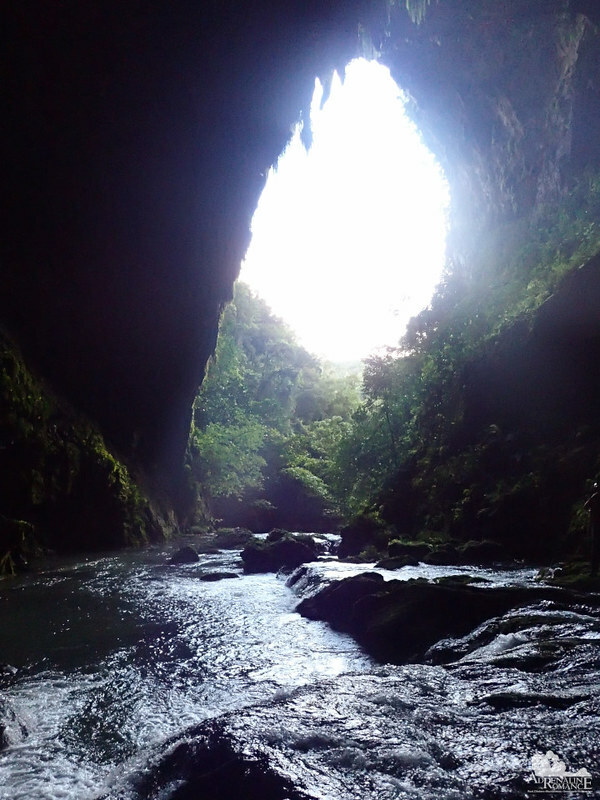 The roar of rushing water echoed through the dark chambers and tunnels inside Sulpan Cave. These sounds came from strong and probably lethal rapids that line up the Humaket River, part of which is in the cave itself. Thankfully, not everything in the cave required swimming through the frigid waters. We also walked on solid ground. 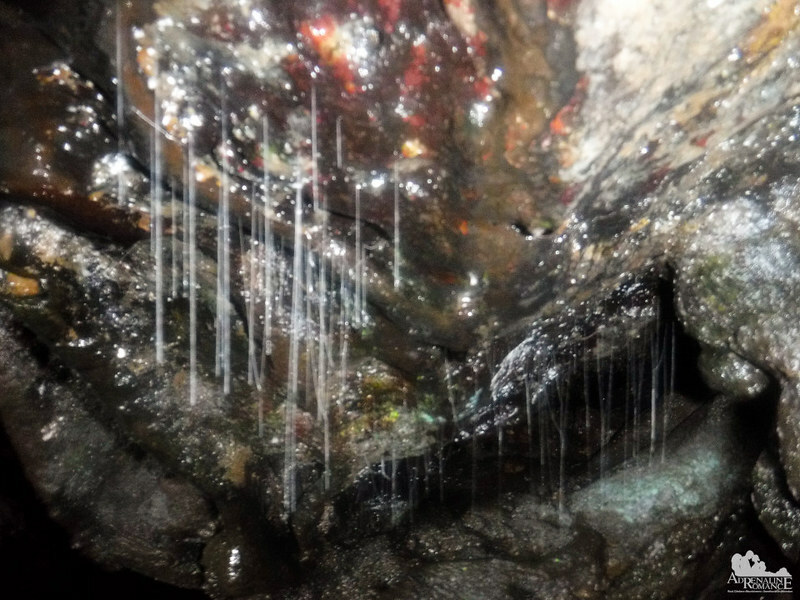 Weird stalagmites and flowstones adorned the cave’s walls and arches. These elongated ones are particularly striking; they are exceptionally smooth as if they’re exquisitely polished. 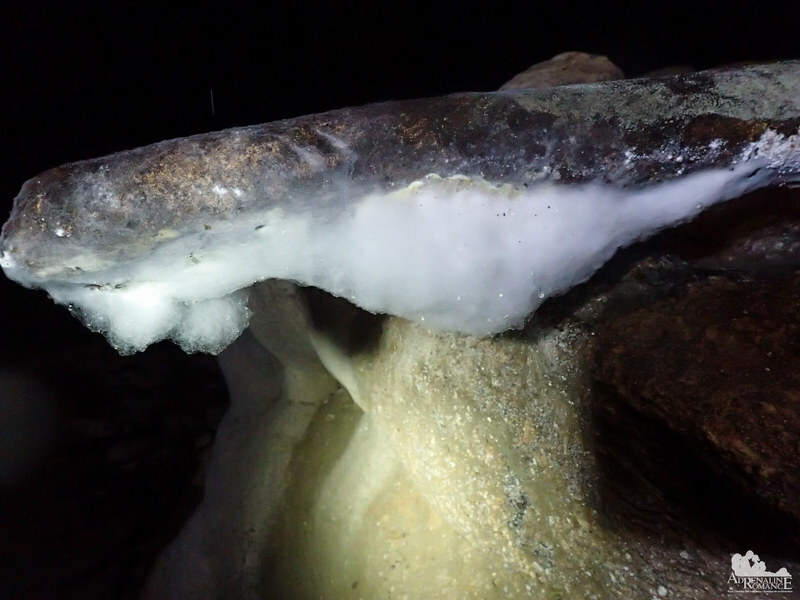 Water erosion in caves does so many wonders. Don’t they remind you of something…anatomical? Hehehe! 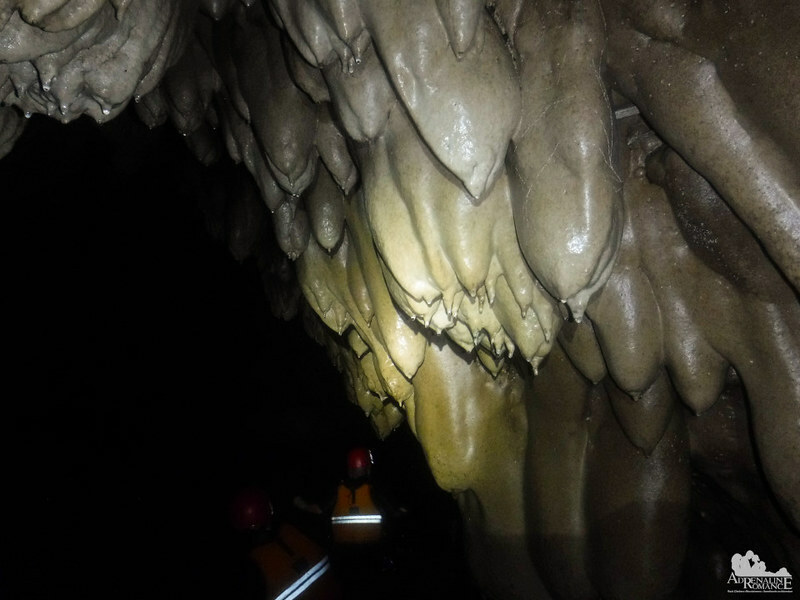 Curtain-like folds adorn the thick stalactites in this grand chamber. For a moment, we imagined they were delicate draperies and chandeliers in some fairy-tale castle. Geological processes inside a cave produce interesting effects. This piece of branch, probably washed away hundreds of years ago, was encrusted with calcium carbonate. Overtime, the mineral deposits formed an extremely fine, extremely delicate spiderweb pattern at the tip of the branch. We found a spot to safely ford across the river and climb up a bank to gain access to the Cobra’s Porch. 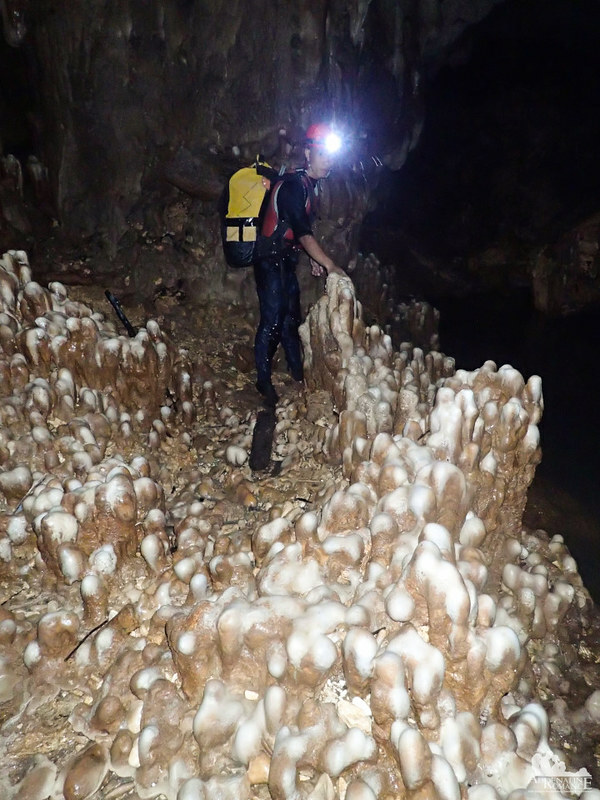 We were surrounded by a forest of thick penile stalagmites. We exercised extreme care not touch or break any of these amazing rock formations. We stopped here for a while to change our camera’s batteries. Feeling hot and exhausted, Kara also peeled off the upper part of her wet suit so she can breathe a little easier. Cobra’s Porch is a massive rockfall that we need to traverse. And it’s not called Cobra’s Porch for nothing! As we climbed the boulders, Entoy called me through a harsh whisper and motioned me to come and take a look. Right beside him, resting on a boulder, was the unmistakable form of a three-foot long cave snake! This was the first time we’ve ever seen a snake inside a cave. 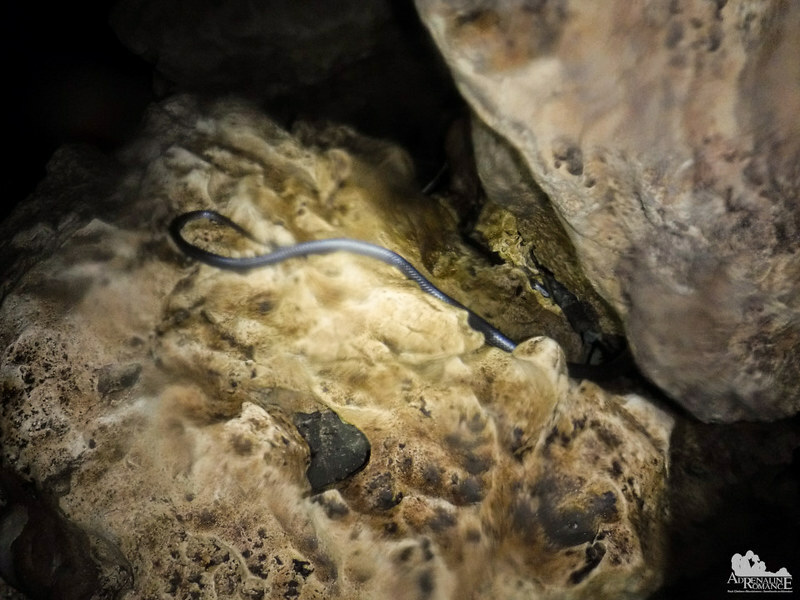 We were not exactly sure what this snake is, but we assumed it was the namesake of this section of the cave. Stealthily, we approached the reptile so we could get a good photo, being careful not to get too close in case it will strike. Apparently, the snake got irritated by our lights and slithered away. The encounter got us unnerved. What if, while groping for a handhold, we could put our hand inside the lair of a cobra or even on the snake itself? What if, in the dark cracks, a cobra will see us as invaders? Snakes weren’t the only creatures inhabiting the cave. We found hairy spiders like these lurking in dark crevices. They don’t seem to be alarmed by our presence, but we did not get too close to them. Just in case. 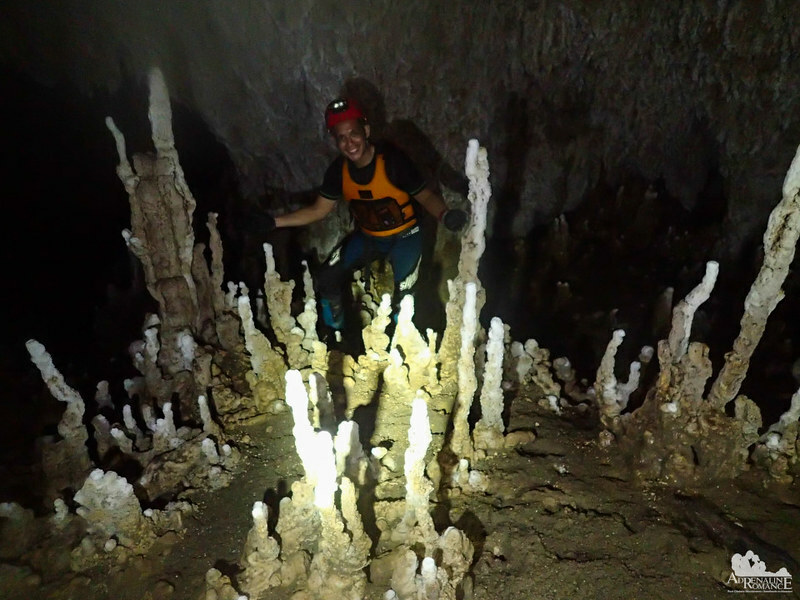 We also encountered thick gnarly columns, apparently formed by uneven layers of calcium carbonate thousands of years in Sulpan Cave’s past. The walls were chalky and soft, so we were careful not to touch them. Penetrating Sulpan Cave was a considerable challenge. We swam in frigid waters, climbed sharp boulders, and trekked on rough ground. As we went deeper, the sounds of the river became more distant and faint. For the most part, we stayed in the main tunnel, following the underground river. But Sulpan Cave extends way more complex than just a large tunnel cave. 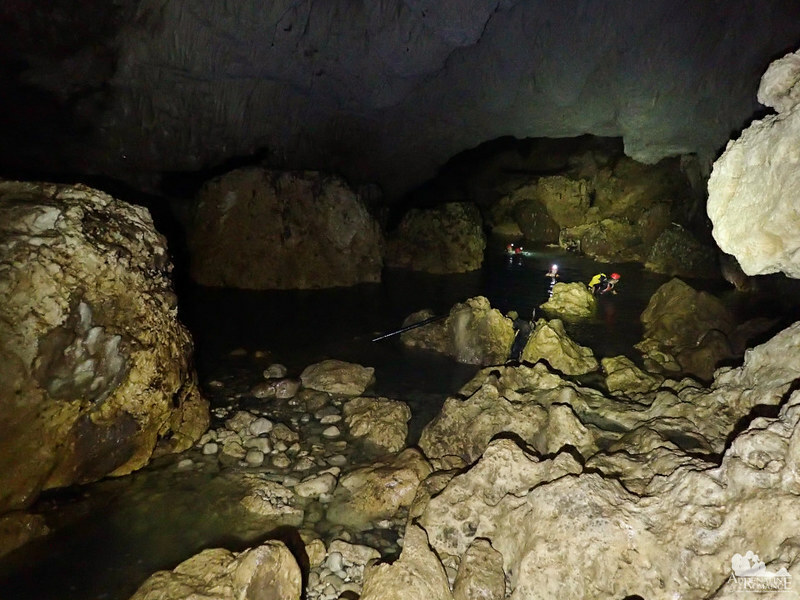 In fact, in a recent 2017 caving expedition by Italian and Slovenian speleologists led by Matteo Rivadossi and Guido Rossi, they have discovered, explored, and connected more tunnels, some of them submerged in silty water. 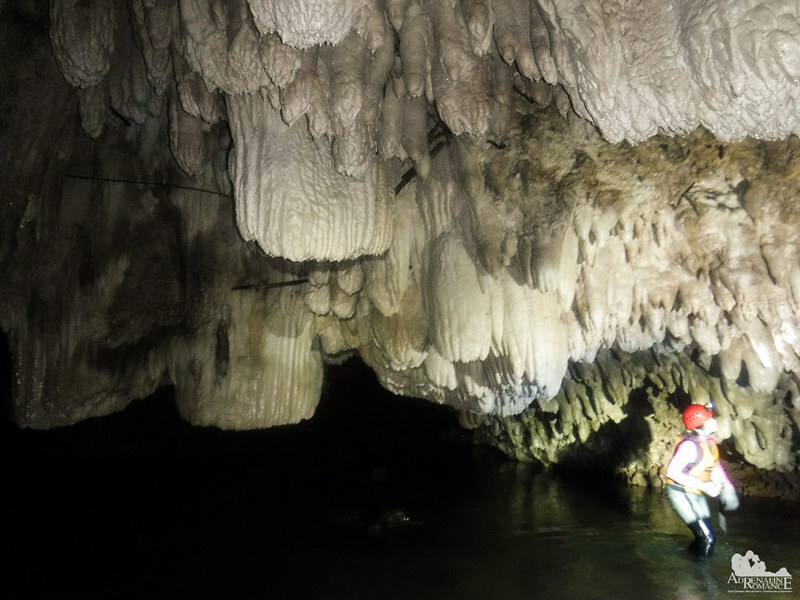 At more than 32 kilometers long, the Sulpan Cave system— particularly the Sulpan-Barruz and Sulpan-Maleho sections—is said to be the longest cave system in the Philippines. More weird speloethem formations! 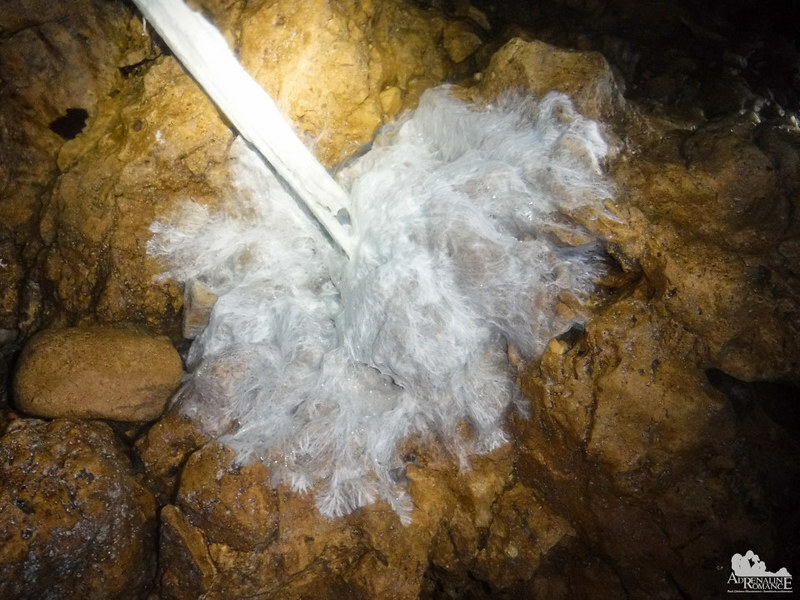 At first, we thought this was a spiderweb, but closer inspection revealed that it was actually mineral deposits that have solidified into a cottony mass. Gly posed in front of a huge tree trunk deep inside the cave. Constant exposure to dripping mineral deposits petrified it; it has turned into a rock-like substance. 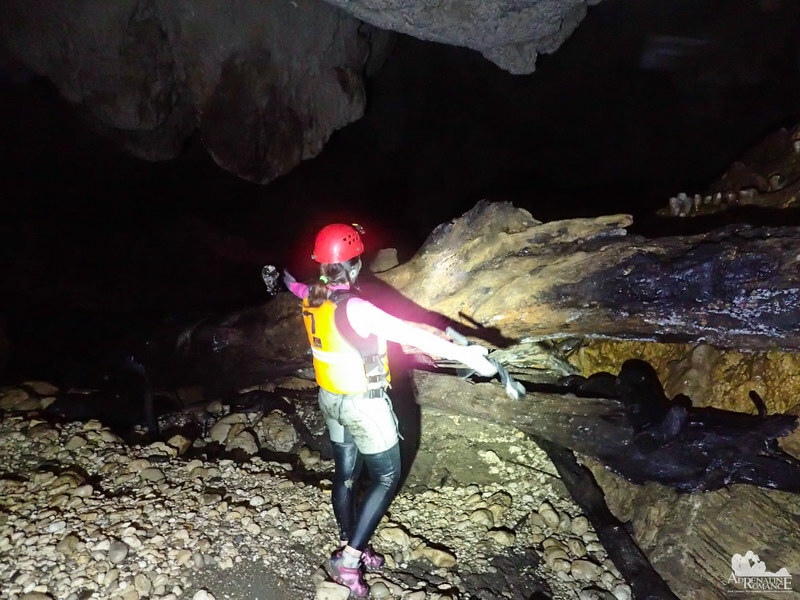 Seeing a tree trunk inside a cave made us realize how dangerous this cave is. 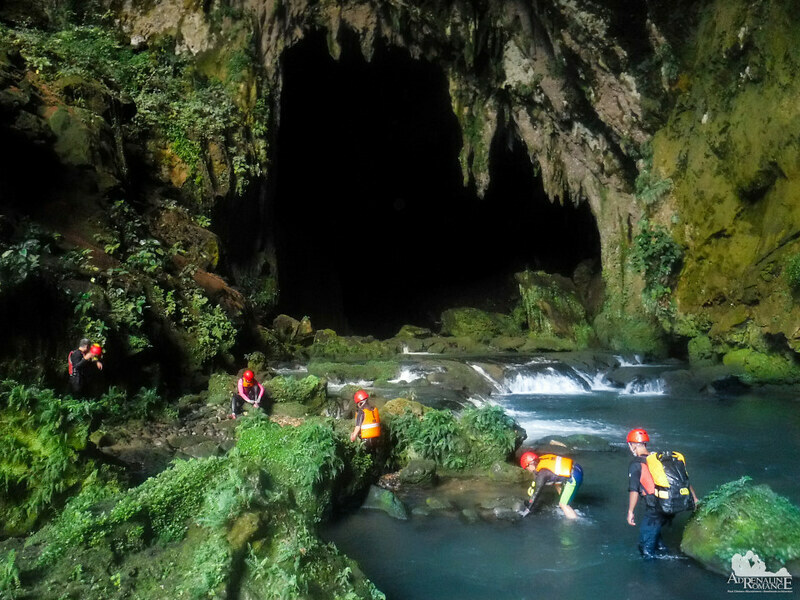 Its presence meant that heavy flooding occurs in this cave. Floods could become so powerful that they carry massive trunks like these. Smaller limbs and branches stuck on the cave’s ceiling also meant that the water can rise up to the ceiling. 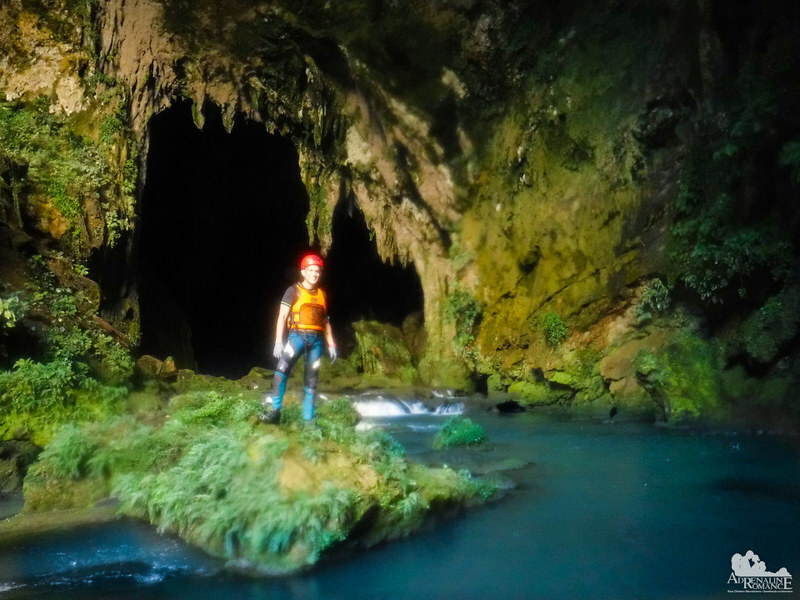 The flooding risk was later confirmed when we checked Sara Francis’ Samar Caving guidebook. Inside a cave, there is no way of knowing if it’s raining heavily outside. If so, there’s a very big chance that we’ll be trapped inside. Although there are flat and sandy open spaces, setting up a camp here is not a good idea. As mentioned before, Sulpan Cave is extremely prone to heavy flooding. Hmmm….what are you guys looking at? 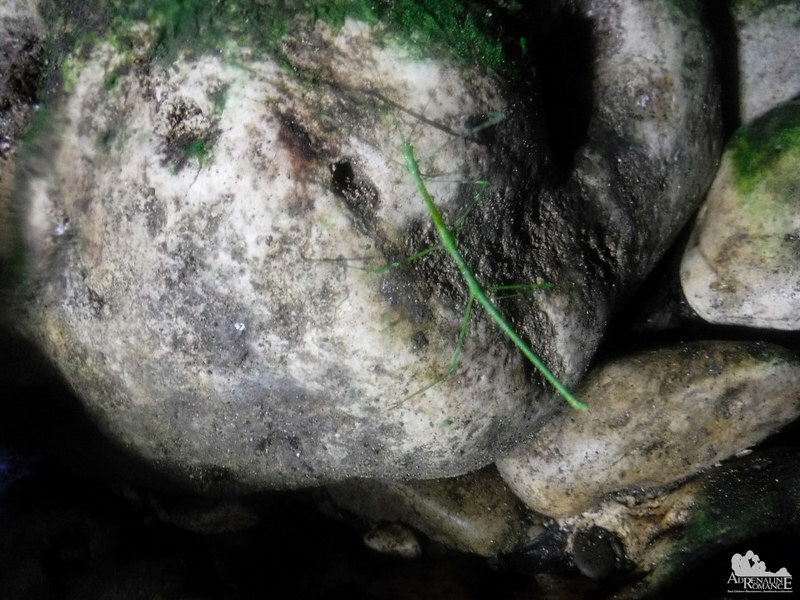 We found several stalks of weird green plants growing inside a cave. This is a mystery of nature. How could they be growing in an environment in complete darkness? If you remember your grade school biology, you’ll recall that green plants require sunlight for photosynthesis, the process of converting sunlight to chemical energy. Furthermore, the plants are growing in loose, sandy soil! The roar of rushing water faded and ultimately died down as we went further south. We became engulfed in a giant chamber of silence. No chirping of bats and swallows. No dripping sounds. The only things we heard were our own breathing and heartbeat accompanied by the crunching sound of small rocks and pebbles as we stepped on them. Joni called this section the Boulder Field. It was a pain to walk here—literally! The large smooth rocks pushed, pulled, and bent our heels and soles—which were already soft and raw by being wet all day—to their maximum flexibility. Like the sword of Damocles, these massive but impressive stalactites hang precariously on the ceiling. An earthquake or a bump could shake those rocks loose. Falling rocks are some of the inherent dangers of caving. Our last major obstacle before exiting through the southern opening of Sulpan Cave is the calm Kassili Lake. We swam in the cold lake, fully aware of the mysterious creatures that inhabit these waters. You see, Joni said that during a recent exploration by French speleologists, a substantially large eel suddenly wrapped around an explorer’s thigh. In the darkness, the eel probably thought the moving thigh was food. Fortunately, no one was hurt, including the animal, during the incident although the speleologist did have the scare of her life. We assumed that the experience scared the crap out of the eel as well. The eel, we guess, learned its lesson as well because it didn’t wrap around anyone’s thighs this time. Finally, after three hours of swimming, trekking, and climbing, we finally saw real green plants on the ground. Framed by the cavern’s fanged mouth and the silhouettes of towering forest trees was the cloudy night sky, the clouds illuminated by pale, ghostly moonlight. Cricket chirps replaced the silence of the cave. We have made it through the Humaket Sulpan entrance! Unfortunately, we don’t have the right camera, gear, and skill to take a photo of the ethereal scene before us. In silence, we spent a few moments admiring the ghostly view of the night while munching on biscuits and slices of cheddar cheese. On the way back, we made a detour below the Hunger Chamber. We found thin and delicate stalagmites rising out of the sandy floor. 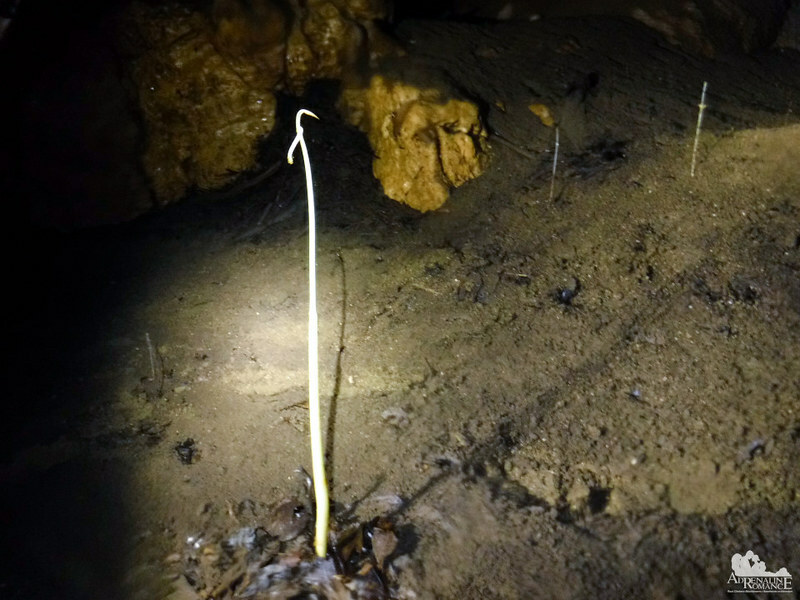 They’re very delicate, so we made sure to stay a few feet of the stalagmite forest. One of the best highlights of this adventure is exiting Sulpan Cave. 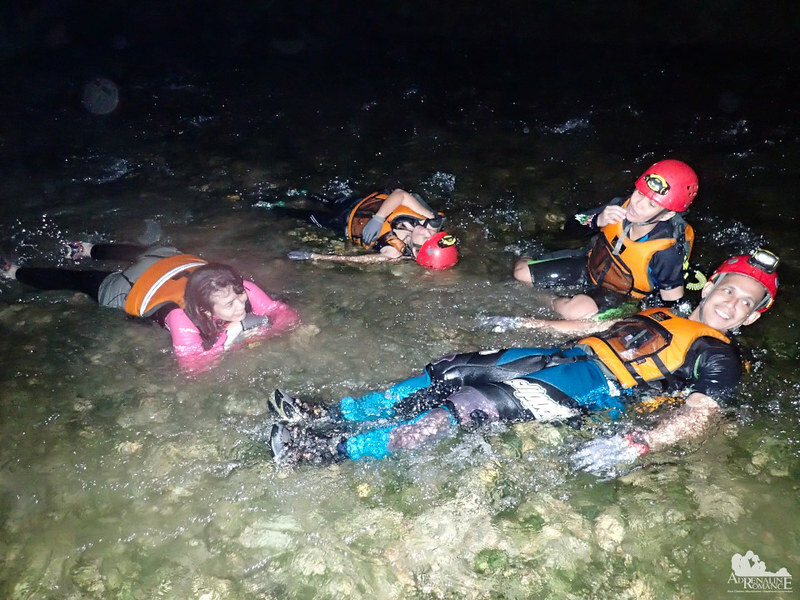 This involved jumping off a waterfall in complete darkness! It’s fear and euphoria rolled into one! After around 4 hours, we finally waded our way back to the upper levels of Pinipisakan Falls where we cooled off by sitting below the curtain of water. A lot of exertion plus the warmth of the wet suits we wore caused us to sweat even though the water was cold. While Sweetie and I rested, Gly, Kara, Joni, and Entoy caught a few fat crayfish that emerged from their hiding places. Later, we cooked them for dinner when we reached camp. Their meat is soft and delicious. Since crossing the strong river at night was too dangerous, we walked along a barely discernible trail back leading to an embankment right across the camp. Now, this was only slightly safer than the way we entered Pinipisakan Falls. That’s because we clung—yes, literally—at the side of a slippery cliff. During freaking night-time, we might add. We made doubly sure that the roots, vines, and rocks we were holding or stepping on can hold our weight or else we’ll go plunging down into the shallow river—and the wicked rocks—below us. After 6 hours of grueling climbing, swimming, trekking, and scrambling, we finally reached the shore where our camp is located. We simply flopped on the riverbed and let the cool water flow through our overheated bodies. Man, that was such a great adventure! And we thank Mother Nature for being kind to us; except for a few scrapes and bruises, nothing untoward happened. We rinsed up and changed into dry clothes to prepare for a celebration out here in the middle of the wild. What celebration, you might ask? It’s Sweetie Sheila’s birthday! Happy birthday, Sweetie! We feasted on barbecue, vegetables, pork stew, and the boiled crayfish that we caught earlier. Exploring caves is a humbling experience. Being so tiny in a void of darkness and knowing that you are at the mercy of falling stalactites, cave-ins, flooding, and other unspeakable dangers truly gives you a better perspective of your place in this world. Sulpan Cave does have treasures more valuable than gold—a re-establishment of humility, a newfound level of respect for Nature, and an opportunity to vanquish the darkness and fear in your soul. Great adventures become even greater when shared with amazing people! Way to go, Gly and Kara! What a huge honor to be among the very few people who have entered, explored, and survived Sulpan Cave! 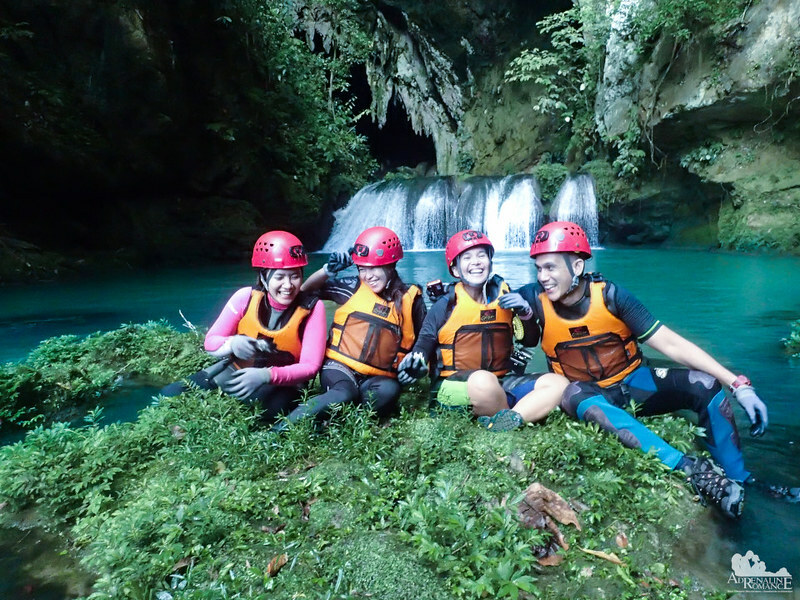 Click this link to read our adventure in Pinipisakan Falls as well as contact details of our provider. 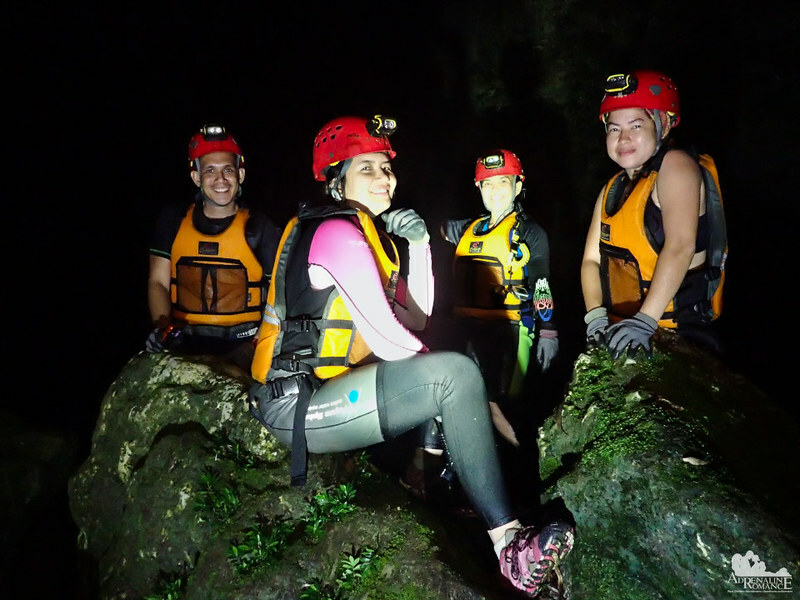 Click this link to check out our Blanca Aurora River adventure as well as tips for readers who want to experience this adventure. 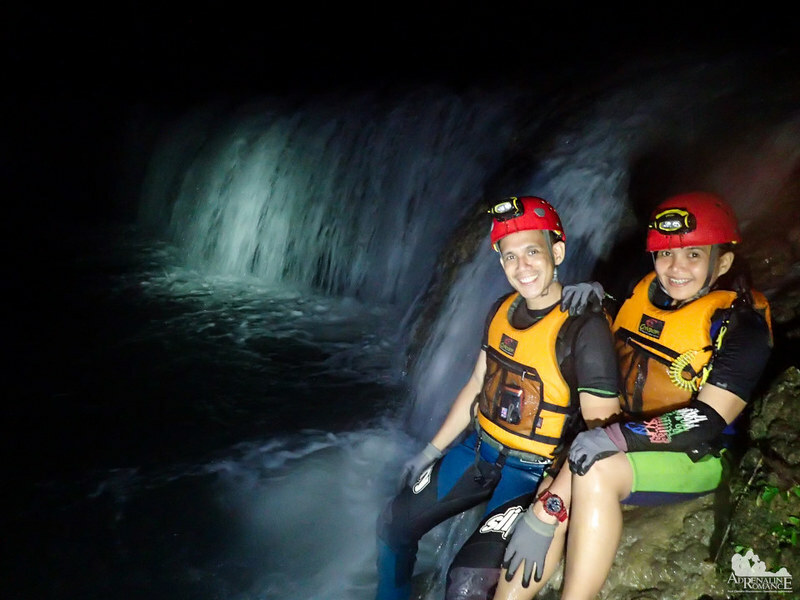 For instructions on how to get to Catbalogan, Samar as well as the contact details of Joni Bonifacio and Trexplore the Adventures, click our Pinipisakan Falls blog. 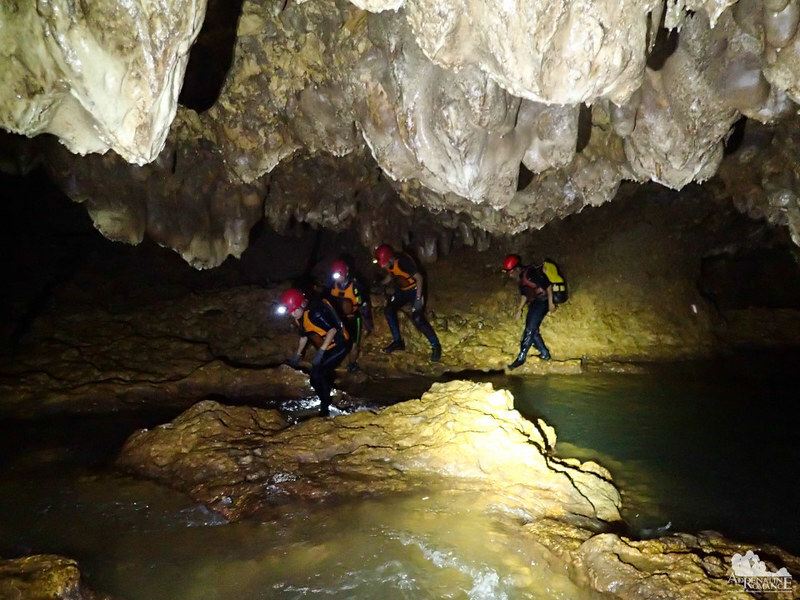 * A minimum of two people are required to organize the waterfalls and the caving trip. To confirm your booking, please pay 50% advanced payment. Advance payment is non-refundable and non-transferable. 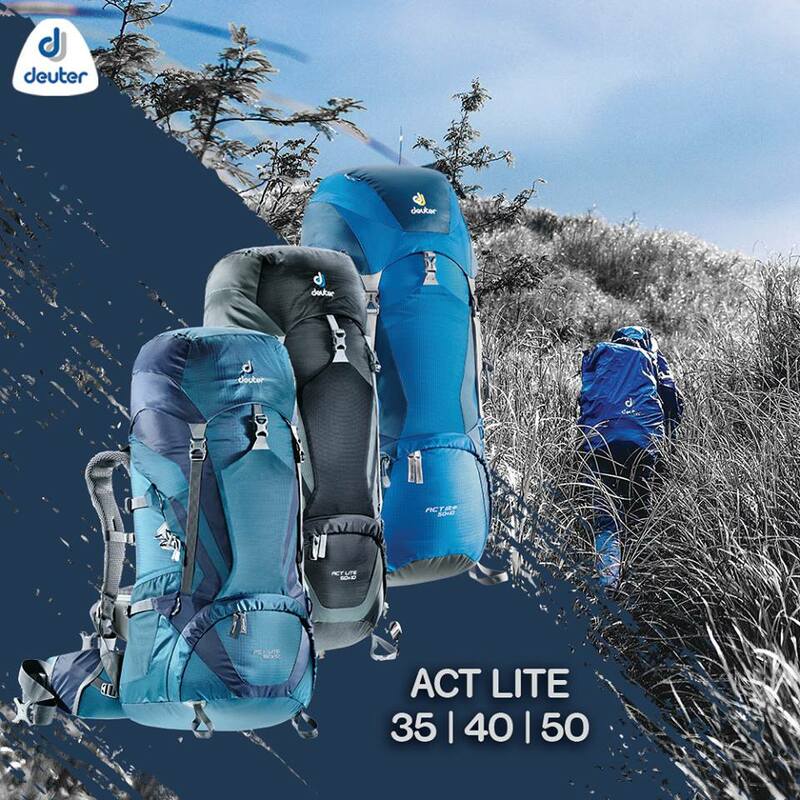 Organizer has the right to cancel the adventure during bad weather, bad security situations, and other unfortunate events to ensure the safety of the participants. 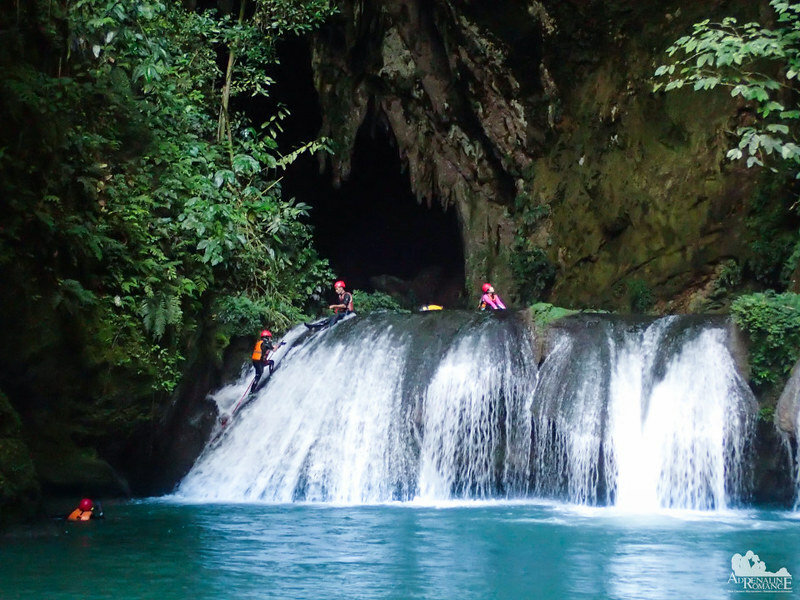 Considering the complex logistics, negotiations with the LGU for security, and the technical requirements needed for safety and for negotiating Pinipisakan Falls and Sulpan Cave, the rate is actually a very good deal. You will be equipped with top-quality equipment from Europe. You will be under the care of a highly trained cave master. Finally, there is a ton of inclusions that add value to your money. This unique experience has more value than a mere few thousand pesos. That makes three of us! The place is truly enchanting. We actually want to go back here and spend a week inside the cave. 🙂 There are 32 kilometers of tunnels here; we just stuck to the main tunnel for safety. Indeed! 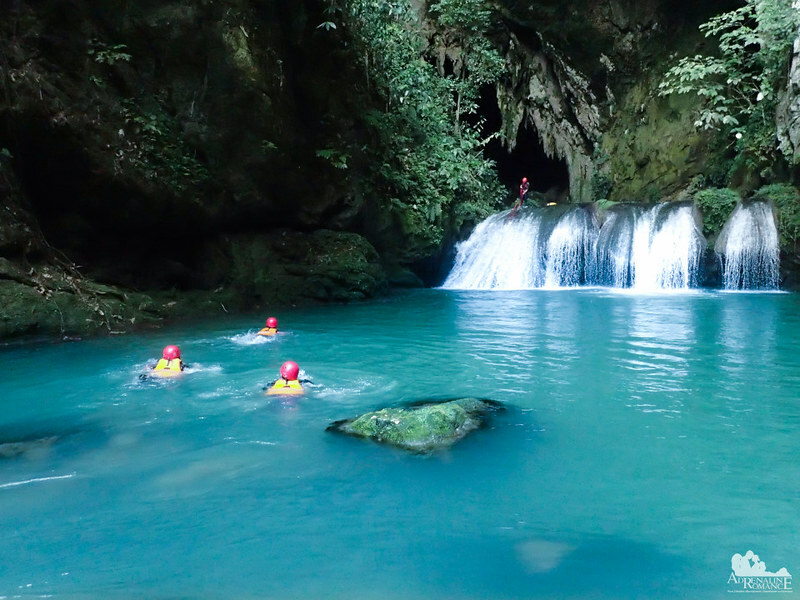 Central Samar is one of the last frontiers of the Philippines. Because it has been somewhat isolated due to the insurgency problems dating back to the Marcos era, most of the wonders there are still intact. We were honored to be the very few “outsiders” who were able to visit this magnificent place. That’s correct. There’s so much more to Samar than meets the eye. And as what we mentioned in one of the earlier comments above, the fear of rebels and the danger of the insurgency problem in that area since the Marcos years have left Central Samar virtually isolated for decades. Even locals fear to tread here. That means the natural wonders there are virtually untouched. That waterfall is so incredible, I love the bright aquamarine colour of the water. 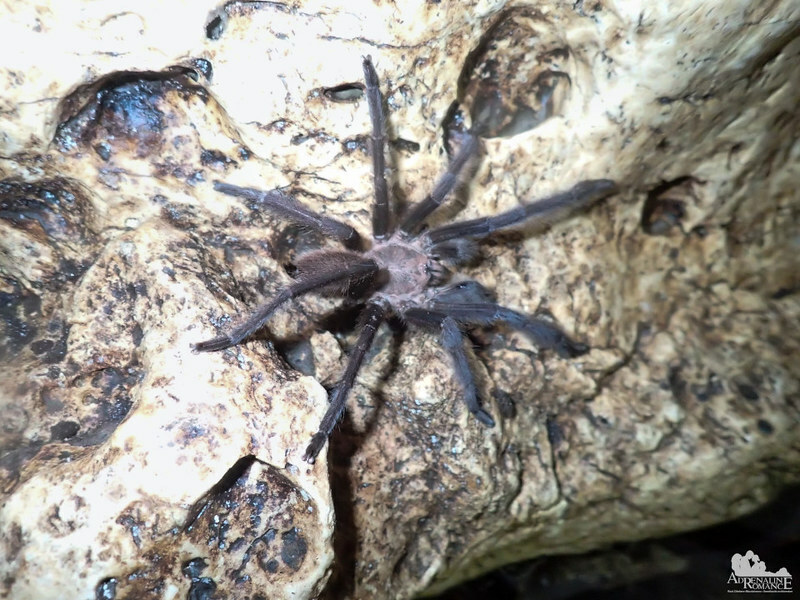 I’m not sure I would be brave enough to go caving – snakes AND big hairy spiders? Pretty sure I would have freaked out! Sounds like you guys enjoyed your adventure though! Incredibly beautiful indeed. About the snakes and the spiders, they’re quite common inside this cave, but we totally held our breath as they move about. We didn’t want to startle them. The Sulpan Cave looks like a paradise. Especially the waterfall and colorful water around it. Once in the cave the structures are amazing. 5k pesos is a great deal to see all this! Sulpan Cave is really a paradise, a realm of fairies. 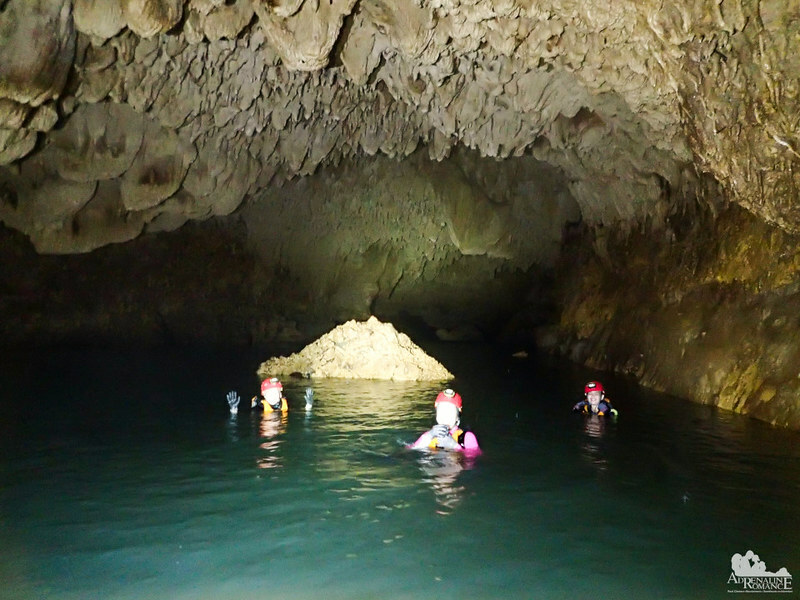 But going inside the cave entails 10K pesos, not 5K pesos. 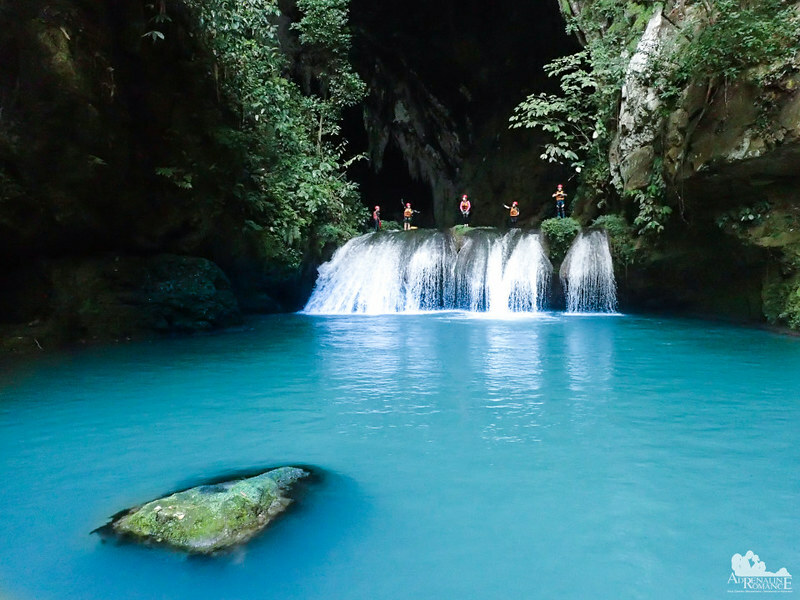 5K is for a one-day adventure in Pinipisakan Falls. What an unreal adventure! You guys are so brave – you must hear that a lot! We’d be too scared to try this, but we can live vicariously through your pictures, thankfully. Now this is some different kind of canyoning 😀 . Gonna keep this in mind for a trip to the Philippines – and… yeah, what better way to spend your birthday than to be out in nature? Indeed! 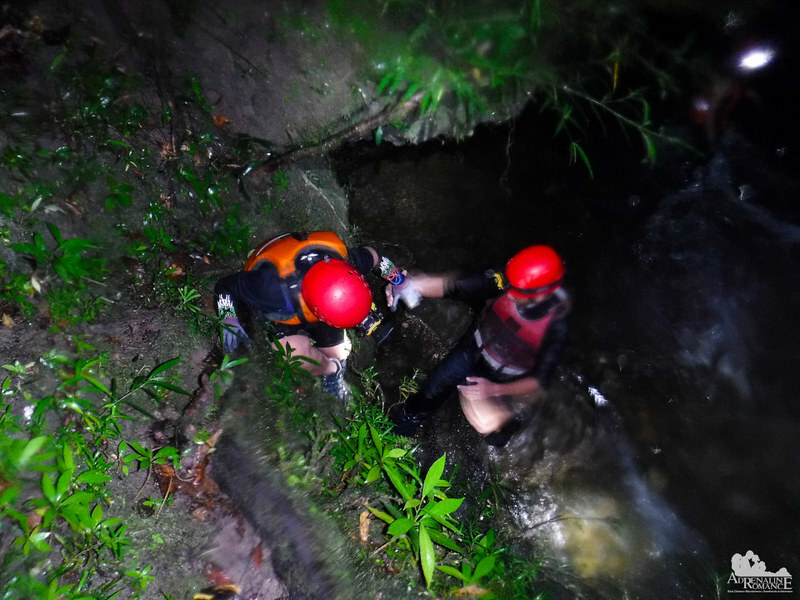 We consider it as “super canyoning.” Hehehehe! 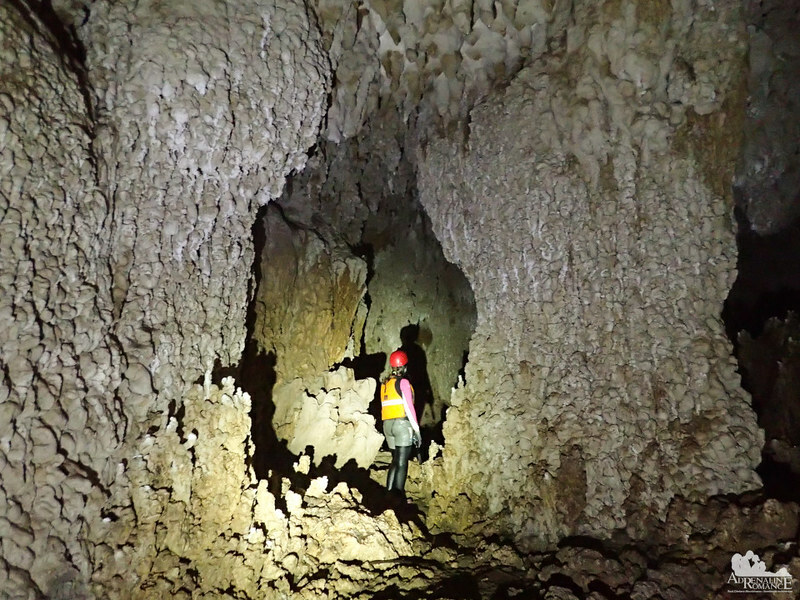 Exploring Sulpan Cave is not scary, but we did feel an immense respect for it. It’s like this cave can just snuff out our lives if it wants to or if we did something stupid and careless. What an adventure! Really thrilling indeed. The waterfalls looked straight out of an adventure movie. 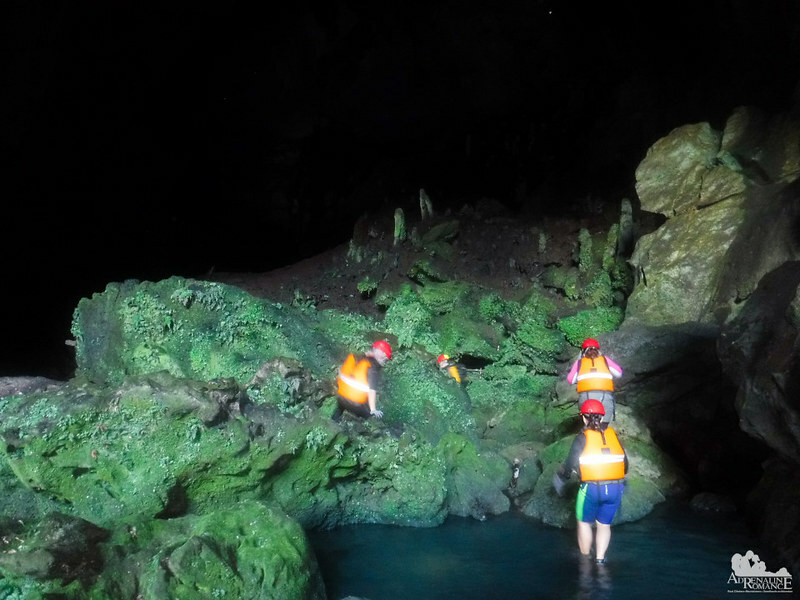 The fact that you swam till the rock and climbed the waterfall makes the experience really exciting and then getting into the dark recesses of the cave must have been a really fascinating experience. Loved reading the post and could feel the excitement.